The sun rises, glinting in the sky like a ball of chipped topaz as the shadows cast by two twin towers gently sprawl across the fresh cut grass. A nation’s anticipation builds to a crescendo as football’s answer to Christmas morning caresses the masses into a frenzy of excitement. Cup final day at Wembley. Or so it once was. Wembley was once the preserve of FA cup finals, the venue for heady, intoxicating European trophy deciders and a treasured haven for the national team. Now it plays host to such illustrious games as Wigan V Millwall in the FA cup semi final and could soon see a third place Champions League playoff between Arsenal and Chelsea. To pay off the massive £798m behemoth the FA entered into a devil’s pact. We would see an increased number of games played in the reincarnation of one of football’s biggest stadiums to recoup its cost. The price of this is that we here at The False Nine now feel that there is something of an over saturation of Wembley football. 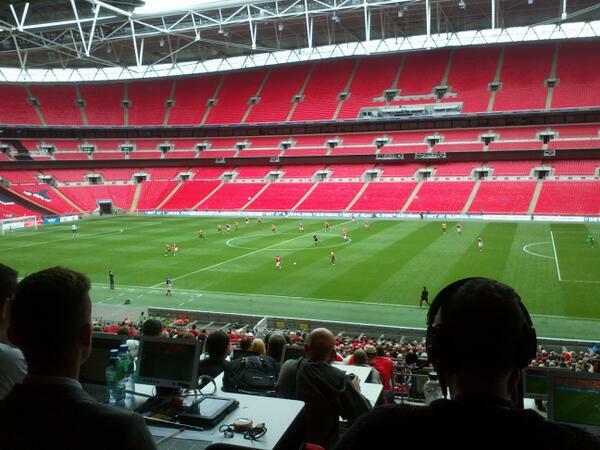 Wrexham have played twice there just this year for the FA trophy and Blue Square Premier Playoffs. Their most recent match against Newport was played for the privilege of reaching the Football League, yet it was set against the backdrop of a sea of empty red seats. No one had the foresight to think that a game played by two Welsh sides from the conference may not fill out a 90,000 seater stadium in the heart of London, or more likely no one cared that it wouldn’t. The seat of Monaco’s football powers is the home of both AS Monaco and the Monaco national team (217th in the world rankings). Pro: The Premier League’s travelling faithful could take massive advantage of the tax breaks when ordering match day pies and enjoy a relaxing riviera casino break during their trip. The FA could also gamble Wembley’s equity on the roulette tables in the hopes of winning back enough money to stop hosting semi finals there. Falcao may be visiting at the time and decide on a whim to sign for Chelsea. Con: Small possibility that AS Monaco will offer every player on both sides significantly higher wages with no tax if they sign for them. Would be of some detriment to the Premiership. The home of NK Imotski in picturesque Croatia. Pro: The obvious benefits in playing against such an aesthetic backdrop is the inspiration that will be bestowed upon the players, forcing them to play in an aesthetically pleasing manner. Anyone who isn’t inspired to play like Socrates on M-Kat by such glorious scenery clearly has no sense of appropriate behaviour and should question their place in the ‘beautiful’ game until they implode into a quiveringly introspective, existential blob. Con: Only seats 4000. Roughly a 35% chance of losing the ball in the Baltic sea if kicked into row Z. Little scientific logic behind the reasoning for the pro. 3. Zayed Sports City Stadium, Abu Dhabi. The national stadium of the U.A.E in lavishly sun drenched Abu Dhabi. Pro: The demand has been there since the whisperings of the 39th game and the swiftly quashed rumours of the Qatari Dream league; the income for all concerned would undoubtedly be enormous. Arsenal could probably afford to convince the majority of the Invicibles squad out of retirement for ‘one more go at it’ while Chelsea could afford to buy Manchester and ban football in the region. Con: Inevitably each player would be forced to play with a small robot jockey on his back while wealthy Arab conglomerate businessmen bet on fights between John Obi Mikel and Per Mertesacker. 4. A raft floating in the international waters of the South Pacific at the antipodal point of the globe to London. Where could be a more neutral venue for the two clubs than the furthest geographical point away from London? Pro: The opportunity for the Premier League to laugh in the face of god as they openly defy the physics of the ocean to play out the game in a scientifically proven neutral venue. The kids in the video make it seem really cute and heart warming as well. If they’re having fun why can’t Fernando Torres? Con: Some logistical kinks to work out. The capital of North Korea and the seat of power of the Supreme Leader Kim Jong Un. Pro: As detailed in a recent game covered by BBC News “Every seat was taken and row upon row of men sat silently, wearing identical dark suits and red ties, everyone sporting a tiny enamel badge on their left breast.” Arsenal would finally have the levels of silence required to concentrate on their intricate passing and finally we would see Arsene Wenger’s Dragonball Z moment. As when Goku achieved his Super Saiyan potential so would Arsenal forge total passing football into a glorious reality. Con: The only possible winner of the match would be North Korea. Also as proved by the infamous World War I Christmas Day match, football is only effective in the short term as a peace brokering measure. A fantastic tribute to man-made stadia nestled in the bustling South-East Asian paradise of Singapore. Pro: Abramovic will be provided with a dedicated stand for his long serving yacht. See Aesthetic argument from Croatia for more applicable pro’s. Con: Arsenal will spend roughly £4m of their transfer budget on replacing balls that Gervinho kicks into the water. The much beloved cultural icon and the once home to the power of Battersea. Pro: One possible incentive is that the winner of the playoff could also keep the deeds to the land surrounding the power station. Chelsea could potentially build a new stadium, while Arsenal could build the first church of Dennis Bergkamp, complete with a lighthouse purpose built to attract Cesc Fabregas to come home. Con: The loser would almost certainly have to be thrown to the ferocious hounds at Battersea Dog’s Home. Nike’s audacious, Eric Cantona officiated, off-shore answer to the European Super League. Pro: Joga Bonita is guaranteed. Con: A likely partnership with UFC would develop. Lionel Messi’s future may suffer as a result. 9. On Fifa in Howard Webb’s house. We can’t decide this in the real world, the meta world is the obvious next step. Howard Webb would be needed to maintain that no one can be found guilty of trash talking, threatening in game messages or restarting the console. He would also limit Rafa Benitez to one minute at most on the Tactics menu. Pro: This would finally mean that Fifa aptitude is recognised for the vital life skill that it is. Rafa Benitez and Arsene Wenger would play first and then select the next four players in a sudden death Fifa showdown that the gods themselves would speak of for millenia. First to three wins of course. Con: There’s always the possibility that there’ll be that one Chelsea player who still plays Pro Evo and not Fifa. In a fitting ‘back to their roots’ tribute, both Roman Abramovic and Alisher Usmanov could agree to give something back to the oil fields that gave them so much by agreeing to host the 3rd place play off in Siberia. Pro: A fitting circularity to the tales of two of football’s comfortable wealth to riches stories; this would also bring the sport to a relatively untouched new audience. We also hear the Great Siberian Railway is a must see. Con: Some players may need new gloves. It would also be difficult to maintain the reasoning behind the current banning of snoods. Any reason for bringing snoods back is a con. The legacy of the London 2012 Olympic Games and West Ham’s new home. Pro: Would probably be the best realistic alternative. It’s in London but it’s not bloody Wembley. If semi finals and play offs were moved here it would be fine, definitely an improvement on the current Wembley system and answer the calls for a continued sporting ‘legacy’ from the Stadium. Con: Something of a hypothetically unfair advantage to West Ham. Also it would imbue Sam Allardyce with too much power, the world would know such fear. Where should Arsenal and Chelsea settle their scores, Rocky III style? This entry was posted in Humour and tagged arsenal, chelsea, English Premier League, wembley by David Wild. Bookmark the permalink.